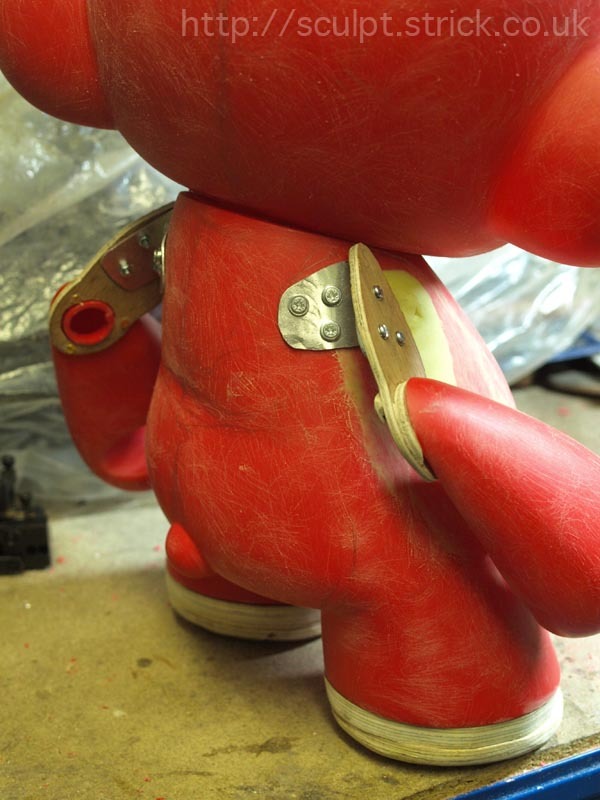 Customising a Kidrobot Mega Munny for exhibition at ToyCon UK. I started by preparing the donor figure which was supplied by the ever-reliable and reasonably priced Raygun Comics. Mega Munnys are much harder to disassemble than their smaller couterparts and it took a lot of effort to prise the head off. Once it was free, I trimmed the neck joint so that it would not lock in place when reassembled. I was a little concerned to find that the vinyl was reinforced inside with expanded foam in several places. I hoped that this would not mean that the piece was in danger of distorting when I later applied heat. Next I needed to prepare the surface. I applied lots of grease-remover and then scrubbed the whole surface down with detergent. If your family already think you are a little strange, there is nothing like disappearing into the shower with a giant decapitated figure and a pot of Swarfega to reassure them. Once it was dry, I roughened the whole surface with a wire brush. Although the aim was to keep the overall silhouette as close as posible to the familiar Munny shape, I felt that some lines just didn't work with the organic look I had planned. The arms in particular looked very unnatural so I decided extend them with a short upper arm and elbow joint. The new arm shape kept the pose very similar but looked more 'right' with the realistic hands that I had in mind. I made the extensions using MDF and aluminium. 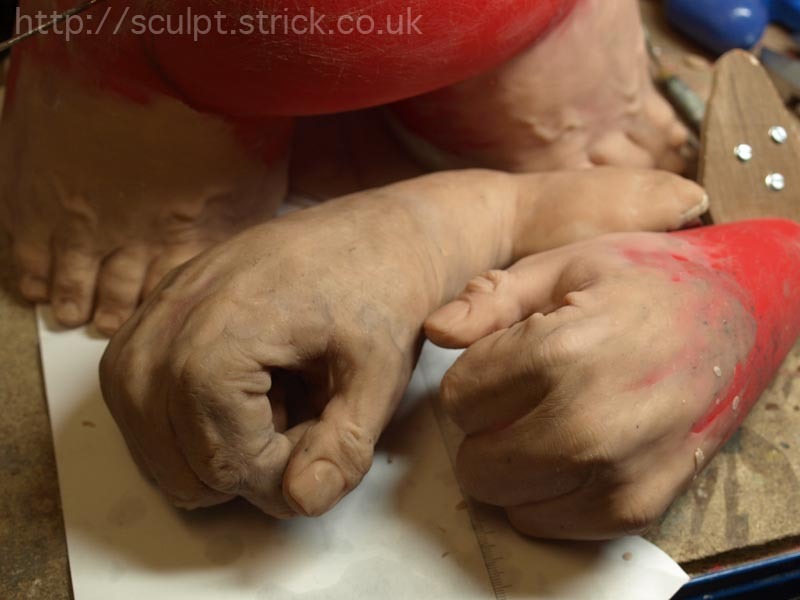 I also added a steel support rod passing right through the body to help take the weight of the large hands. I extended the very stumpy legs with a couple of centimetres of MDF to allow room for adding toes. 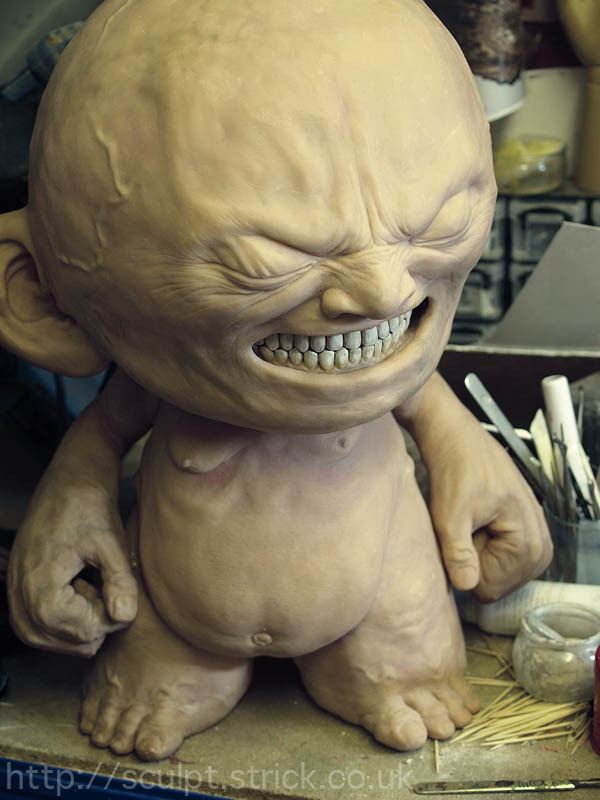 I started the actual sculpt with the hands. 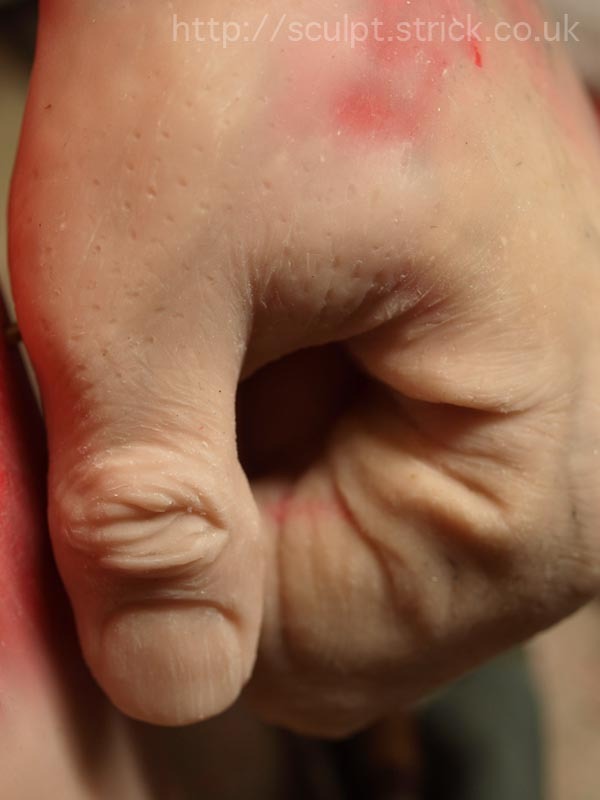 The only way I could see to make the Munny's hands look anatomically belivable without completely butchering them was to treat them as if they were the palms, knuckles and base of the thumb and to add the remainder of the length of the digits. It took a while to find a pose that both looked natural and fit comfortably around the donor hands. 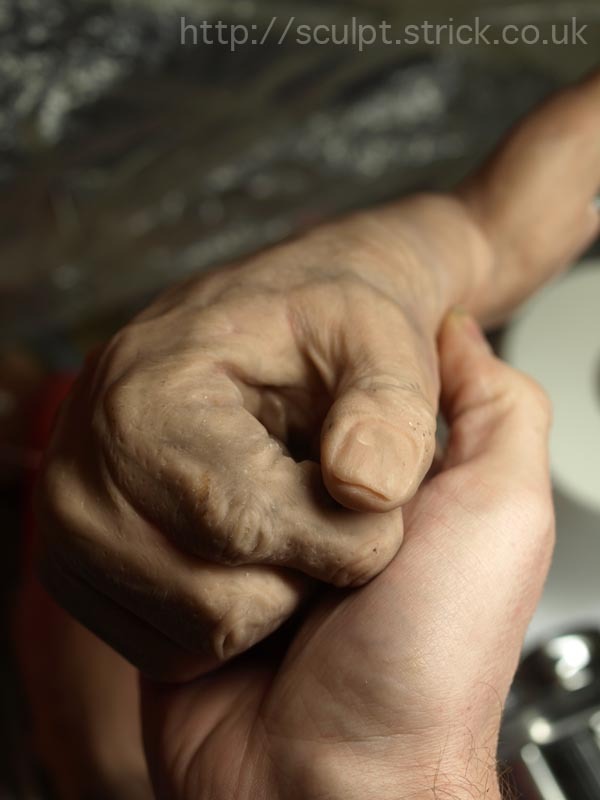 I wanted the hands to be slightly inhuman and so gave them only three very thick fingers. Once I was happy with the blocked-out layout of the fingers I started fine-detailing and adding texture. 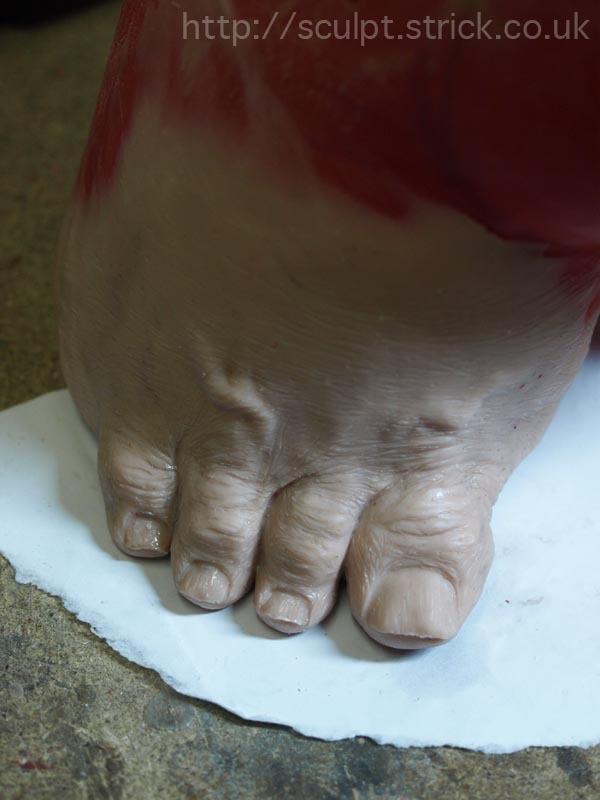 Next I worked my way up from the toes, trying to create the impression of underlying bone and muscle structures without altering the overall form too much. When I first envisaged the project I had expected to use stamps and sponges to texture much of the surface but I quickly found that that wasn't going to be good enough for this job. 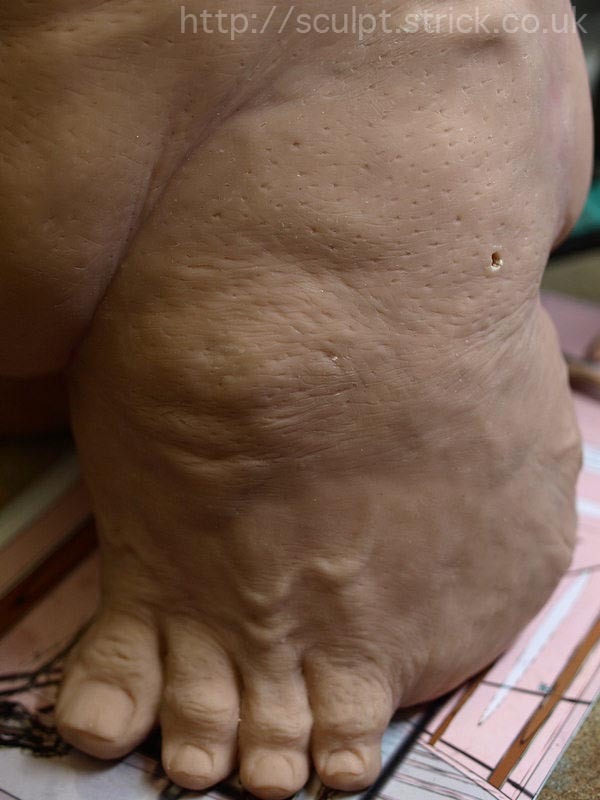 I needed very realistic skin, which meant individual positioning of small surface details like pores and lines, which is a very time consuming process. 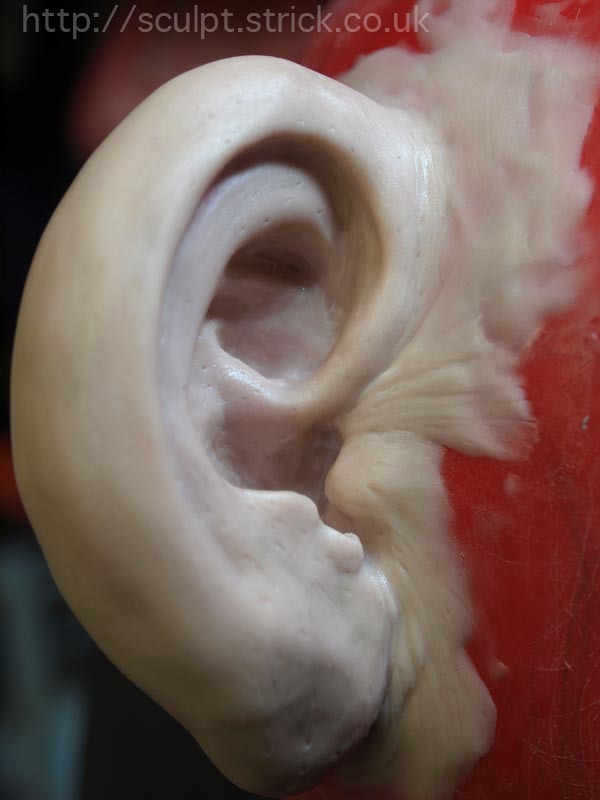 I sculpted large overlapping sections, baking the whole figure to cure the polymer clay as I completed them so as to avoid accidental damage of finished areas; it's all too easy to lean on a delicate bit of fine detail while concentrated on sculpting another part. When it was time to start work on the head, I began by cutting out the mouth/jaw area and hollowing out the ears. I also cut out a panel in the back of the skull to allow access to the interior while working on the mouth. 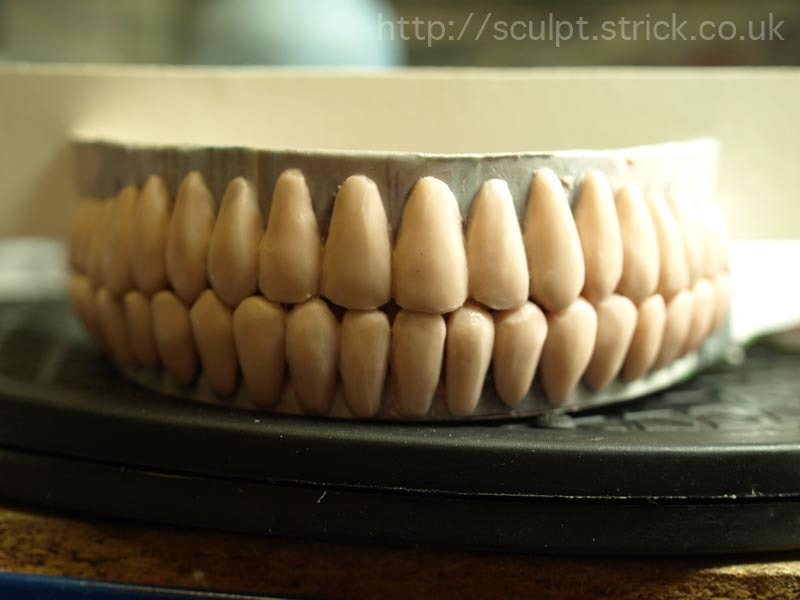 I sculpted the teeth individually on a simple card former that was bent to the correct curve for the mouth. 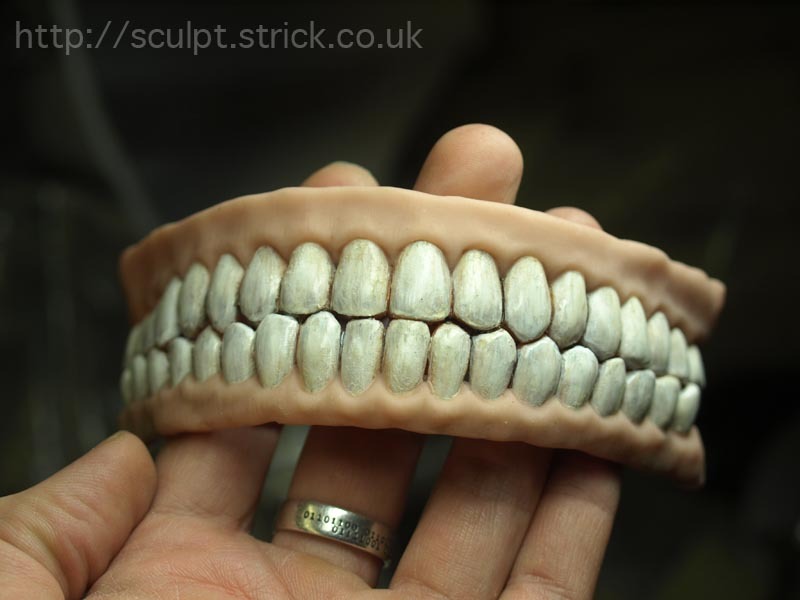 I then cured and painted them before sculpting the gums over the top. I peeled off the card and reinforced the structure with Milliput. 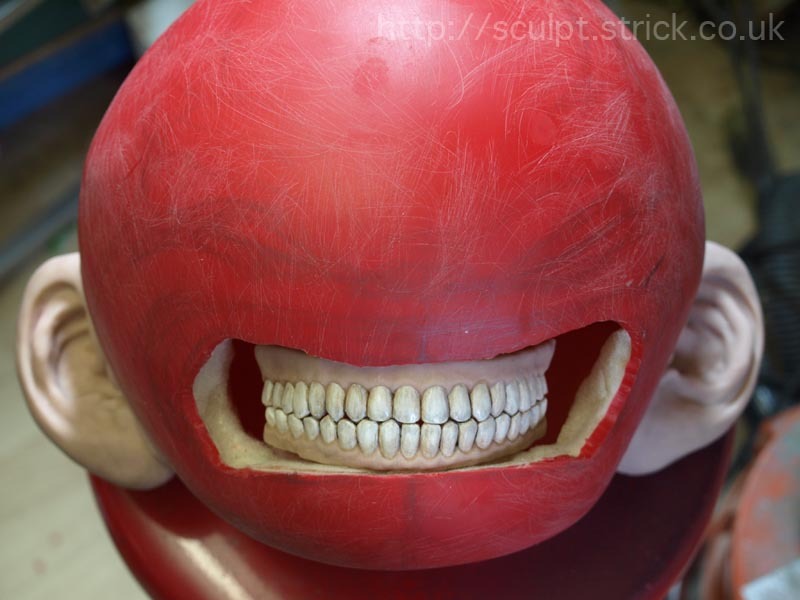 The teeth assembly was fixed in place in the head with cyanoacrylate and further bonded with Milliput. 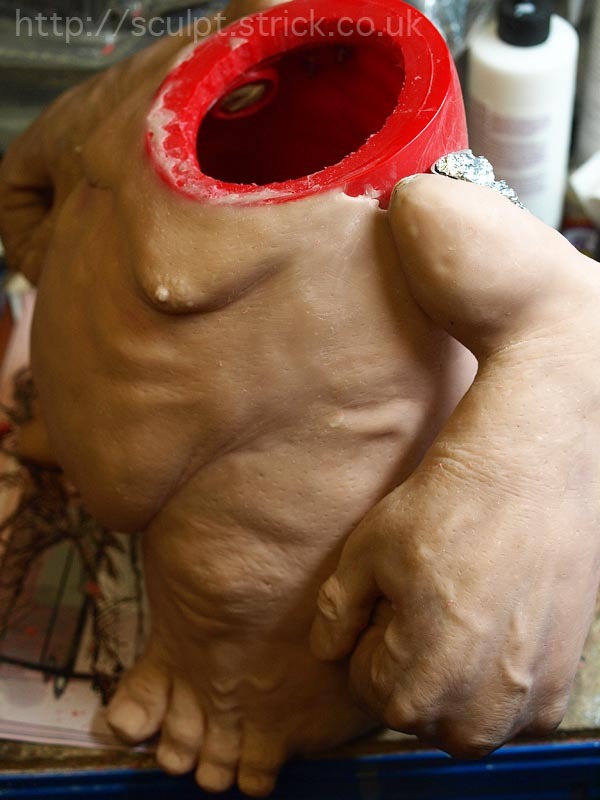 I built up the interior of the cheeks with polymer clay, using aluminium foil as an armature. 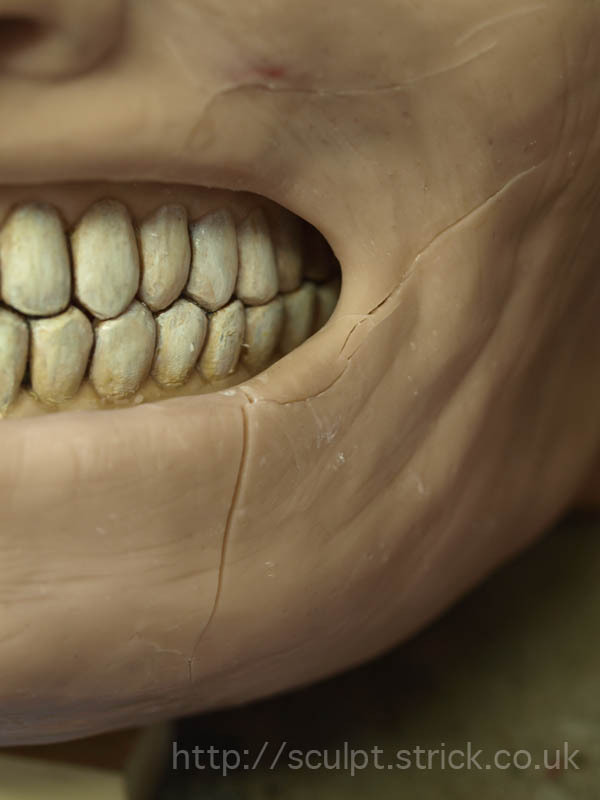 With the teeth installed, I started adding facial features, starting with the ears, which acted as convenient handles during the rest of the sculpt. I'm not sure why he has such an angry, pained expression but that was the way I first pictured it when I had the idea for the concept. 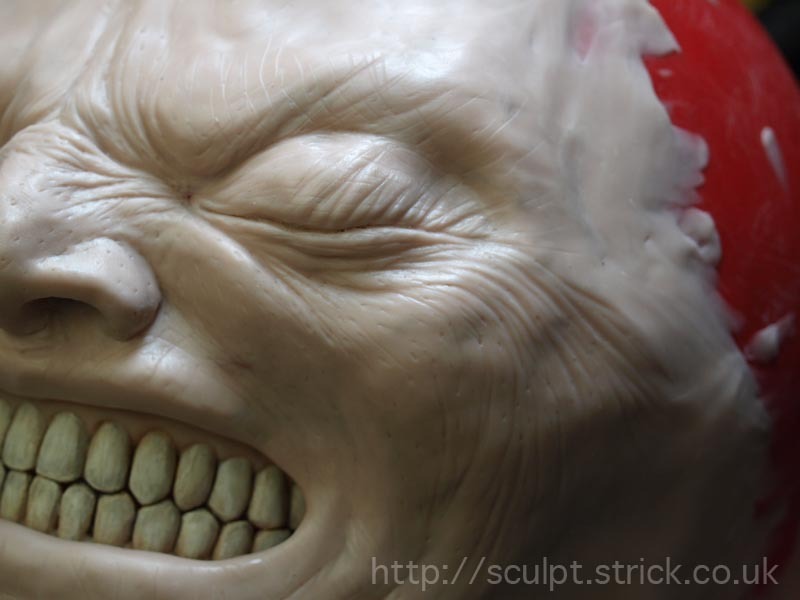 I sculpted the eyes closed as I didn't want them to be the focal point of the figure but to encourage the viewer to explore the whole piece. I had several instances of nasty cracks appearing in the polymer clay. This was quite upsetting after taking so much care detailing and texturing the surface. It seemed mainly to occur during baking and to be mostly where different media had been used in the support structure. Vinyl appears to flex along with the clay as the temperature changes, minimising cracking but more rigid surfaces can cause problems. 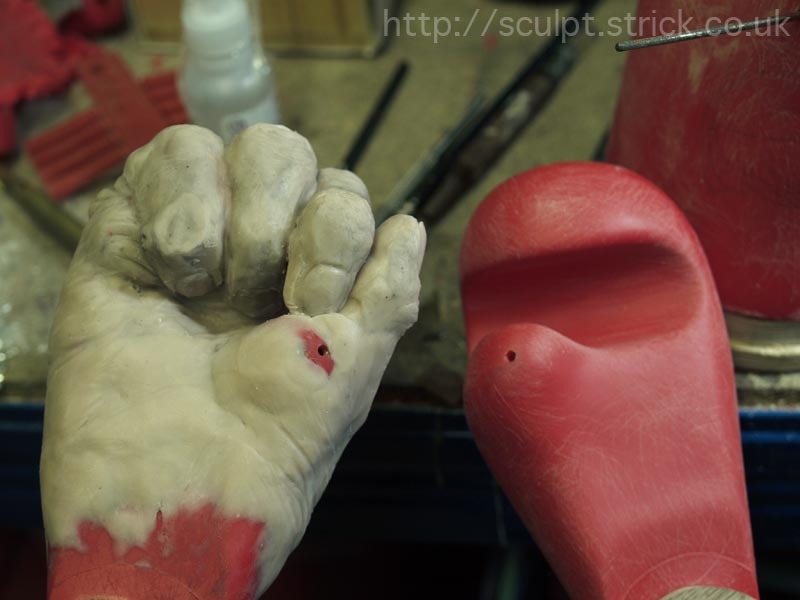 Where cracks appeared, I flooded them with cyanoacrylate and patched them with more clay ready for the next bake. I also found that I could cure small patches of clay with a heat gun, thus avoiding more potentially risky bakes for the whole figure. Keeping the oven on its lowest setting and allowing at least two hours for it to cool down after baking helped reduce instances of cracking. Part of the way through sculpting the details on the head I noticed that the weight of the clay was causing the neck to sag out of shape. Remembering the foam I had found when I originally dismantled the figure, I first used a heat gun to get the neck back into shape, then filled the lower part of the head with expanding foam filler. This set to a lightweight solid mass that securely reinforced the shape of the head. 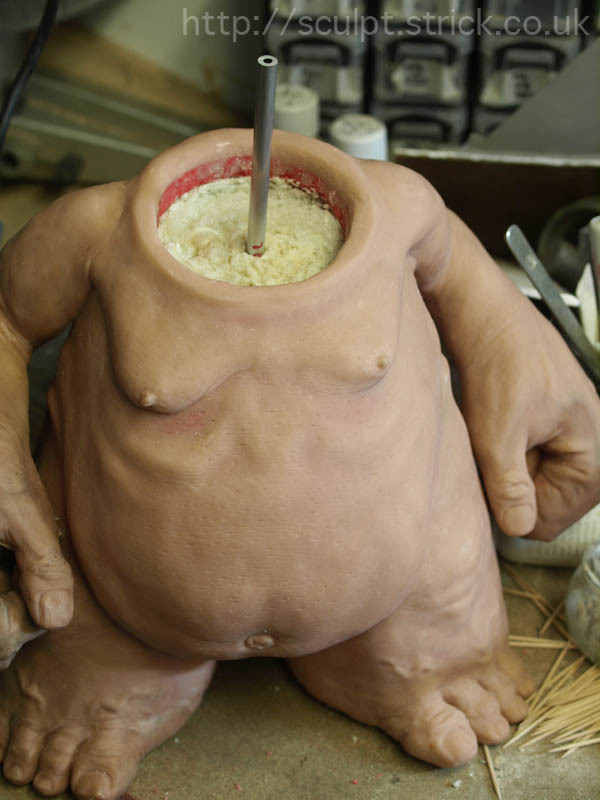 Realising that the extra weight of the head might cause problems elsewhere, I decided to fill the body with foam as well, taking extra care to make sure that the area around the neck and shoulders was well filled. Once the head sculpt was complete, I fixed an aluminium rod into the foam in the body and drilled a receiving hole for it in the head. I bonded the two parts together with 'No More Nails'. Once the join had dried, I filled the gap with Milliput and added a texture layer of polymer clay to blend the head and neck together. I cured the polymer clay with a heat gun. 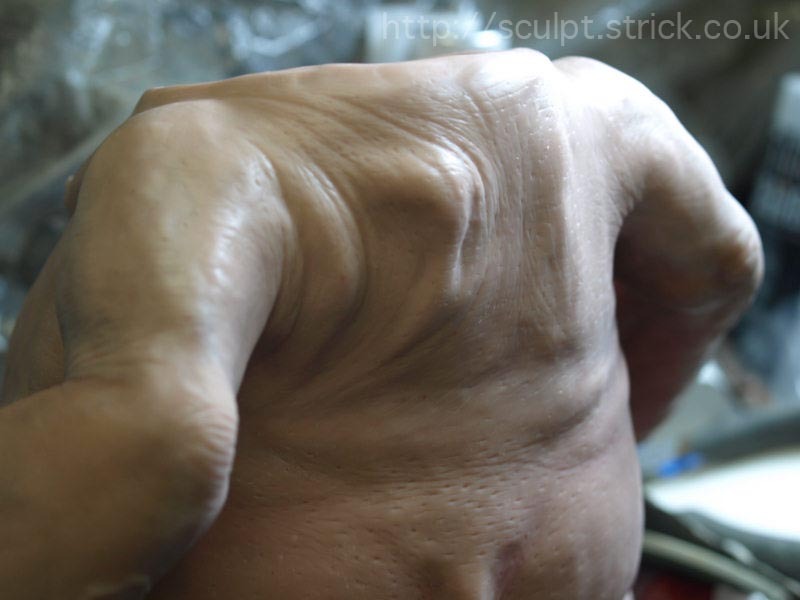 Curing in this way is risky as the clay can get very hot very quickly and conducts heat effectively to other parts of the sculpt, meanng that there is a serious danger of cracks appearing. 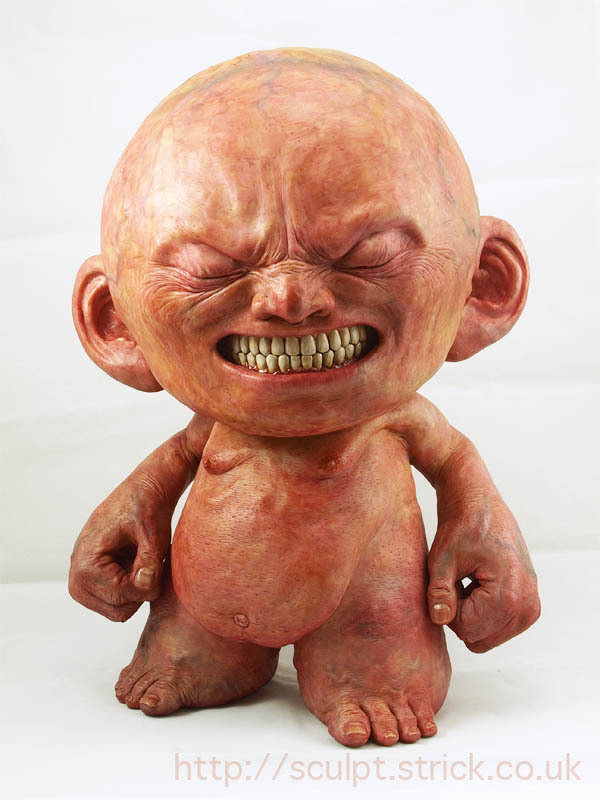 I painted the completed figure with layers of inks and glazes, using my airbrush for fine blending and a fine brush to add small details like veins. I tried to get an organic, transluscent look. More pictures of the completed custom are here.